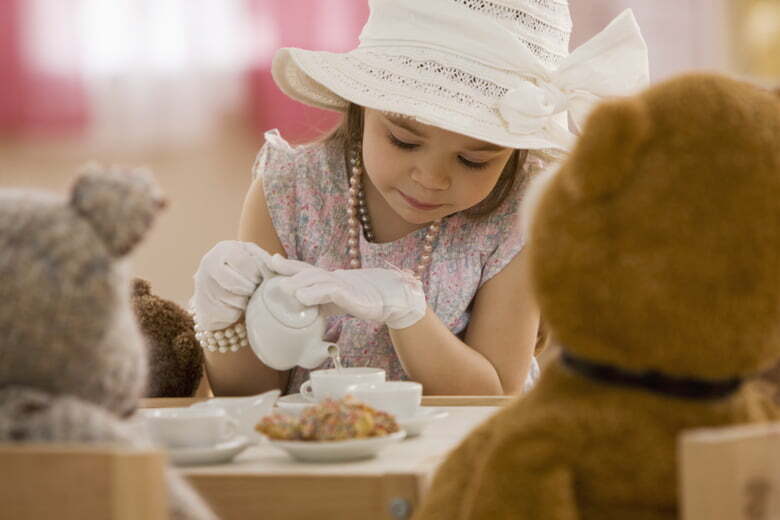 Brew up a teacup of fun at one of the five best places for a kid’s tea party in L.A. If you’re a parent, babysitter, or nanny looking for a fun (and different) afternoon activity to do with the kids, why not treat your little ones to a tea party? Invite their favorite friends and book a table for afternoon tea! Your kiddos will love donning fancy attire and dining on mini sandwiches at one of these five best places for a tea party around Los Angeles. Hours: Monday-Saturday, 10 a.m.- 8 p.m. | Sunday, noon-5 p.m. The heart of Hollywood may seem like an unexpected location for a tea salon that caters to kids, but Hi SocieTEA serves a children’s high tea ($25) every day. Owner Katie Cazorla is one of the stars of the Second Wives Club show, and her tea salon is charming and unpretentious. Currently, the space consists of bar-height seats inside and table seating al fresco, but construction is almost complete on their expanded tea lounge. The adjacent space, which is scheduled to open on Sept. 1, is set to introduce Teddy Bear Tea, when kids can bring along their favorite stuffed animal to join them for a fun afternoon, and each guest gets a stuffed bear to take home. Hours: Monday - Friday, 2 p.m. - 4:15 p.m. Located smack dab in the middle of the Grove, American Girl Place is a shopping mecca for devotees of the famous dolls. Head up to the second floor and past the eye-catching display cases filled with the original selection of historically-themed dolls and into the magenta and pink American Girl Cafe for afternoon tea. The main dining room can be rather loud, so request a table on the much quieter patio, where you’ll be able to overlook the Grove’s dancing fountains down below. Be sure to have guests bring their favorite American Girl Doll, because she’ll get her own high chair and tea service. The food selection is definitely geared for children and includes mini cinnamon rolls, tea sandwiches, fruit kabobs, and chocolate mousse that’s served in a tiny flower pot and topped with a daisy. The cost for the traditional tea is $20 per person, and champagne and wine are available for an additional charge. Hours: Open daily, 10 a.m. - 5 p.m. The Tea Rose Garden, located in charming Old Town Pasadena, is a cozy spot that’s been serving up tea for over 20 years. The Tea Rose Garden offers an extensive menu of different types of teas, but Children’s Afternoon Tea is definitely what sets them apart. For $18, kids receive a sandwich (peanut butter & jelly, raspberry cream cheese, cucumber cream cheese, or strawberry nutella), a chocolate chip scone, fresh fruit, a cream puff, and either lemonade or decaf peaches and cream tea. Their tea menu is extensive, and there are lots of delicious items that can be ordered a la carte, including a number of fresh salads. Hotel Bel-Air's "Little Royals Afternoon Tea"
Afternoon Tea Hours: Friday & Saturday, 3 p.m. - 4 p.m.
For a special occasion, there’s nothing like the Hotel Bel Air. Home to the famous swans and nestled in the lush and private Bel Air canyon, this is as fancy as afternoon tea gets. The Little Royals Afternoon Tea ($36) features tea sandwiches and sweets that are not your usual fare (read: not ideal for picky eaters). Service is impeccable, and kids who want to feel very grownup will love dining on buttermilk almond scones, grilled gruyere sandwiches, and the signature swan cookie. Your little one will swoon over the luxurious hot chocolate served with whipped cream, and moms will appreciate the addition of a glass of champagne. Hours: Open daily, 10 a.m. - 4 p.m.
Montrose is an old-fashioned little town tucked away off the 210 freeway, but you can’t miss the T Room’s bright yellow building. The space inside is yellow, too, but it’s a beautiful, high-ceilinged room with sparkling chandeliers and lots of tea-related ephemera. Their Prince and Princess Tea ($18) is a child-friendly version of traditional high tea and features a freshly brewed pot of hot chocolate (or tea or lemonade), finger sandwiches, cranberry scones, fresh fruit, and tiny desserts. If you’re looking for a place to host a private tea party, look no further than the T Room. They specialize in private events with exquisite tea buffets and custom cakes. Did we list all the best places in L.A. for kids’ tea parties? Let us know in the comments below!